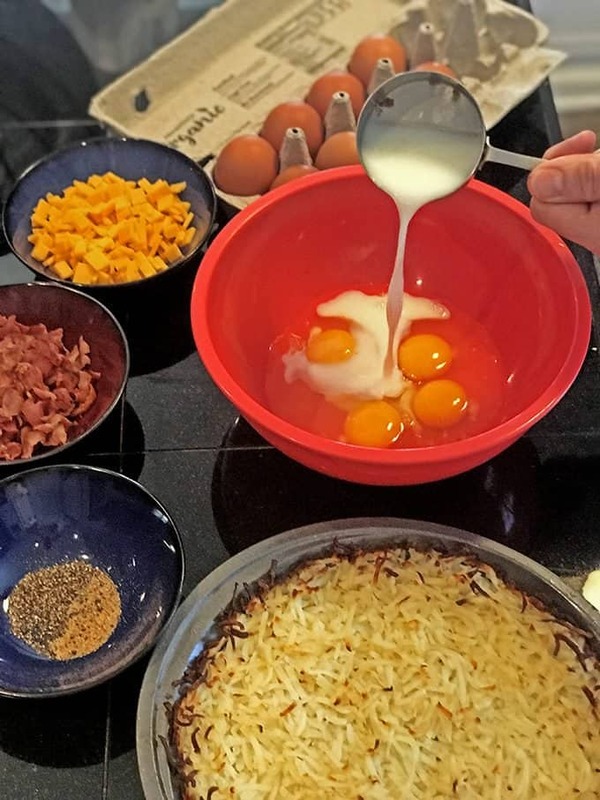 Saturday mornings always come quickly and if you’re looking for a simple and to feed your early morning weekend gang, this easy breakfast quiche recipe is just the ticket. 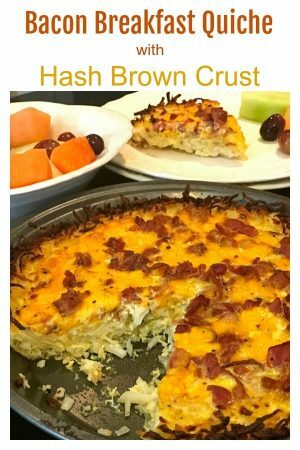 Make this hash brown quiche and take time for that second cup of coffee, after all it is the weekend! This easy breakfast quiche recipe will feed a crowd for about $10 or less! I feel that some of my best recipes come from when we are spending time at our little cottage in the middle of Nowhere Wisconsin. I am not certain why. I think that it is the challenge of using what we have on hand there, and most times it’s not a lot. Melted butter is combined with hash browns to make the crust for this gluten-free quiche. 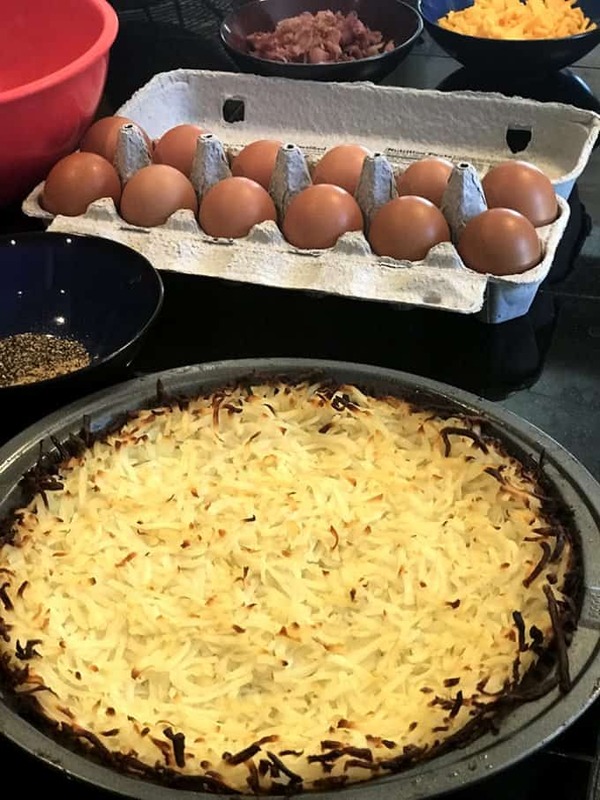 The hash brown crust spends about 25 minutes in a 450° oven before the quiche filling is added. This past weekend was the first time in a long time that we were at our cottage. Because of this, we literally had nothing on hand. On the way up, I stopped at the gas station and ran inside to do a quick shop. 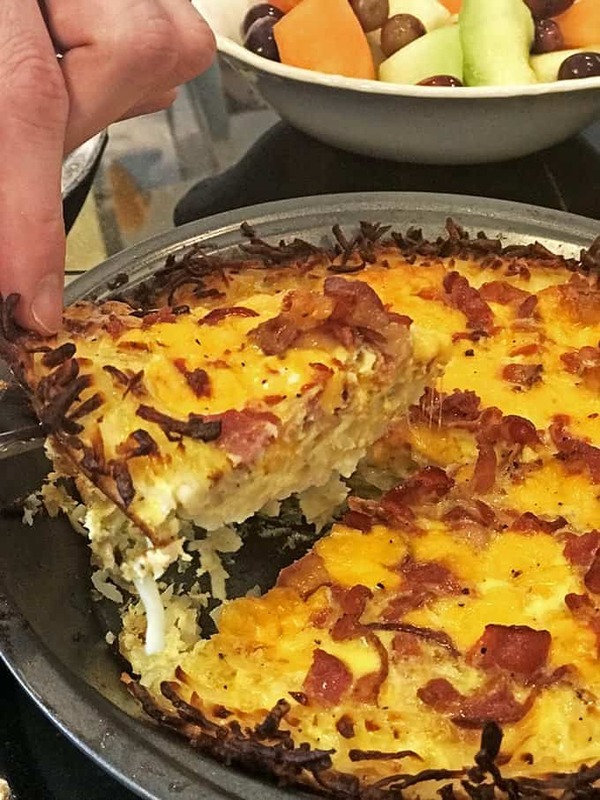 When I saw that they had a package of hash browns and eggs, I knew immediately what I was going to make for breakfast, this hash brown quiche with bacon. 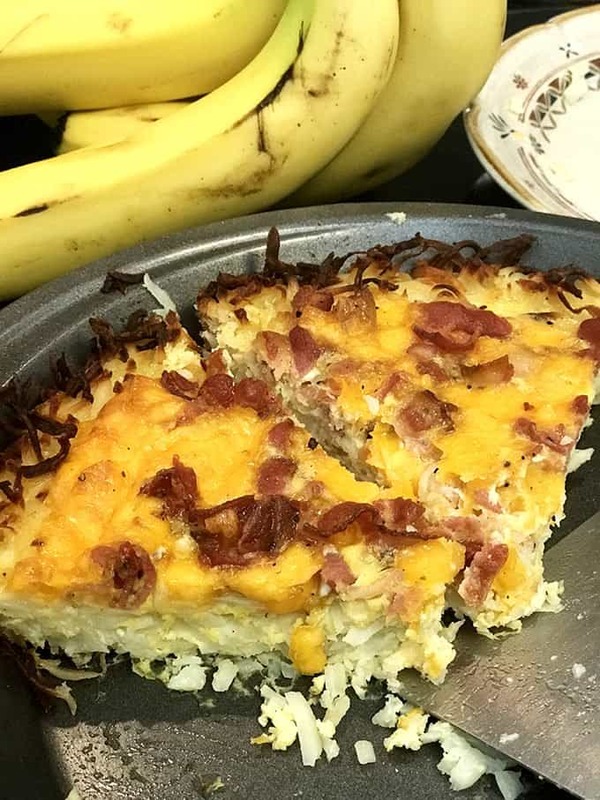 It only takes a few basic ingredients to make the filling of hash brown crust quiche with bacon. 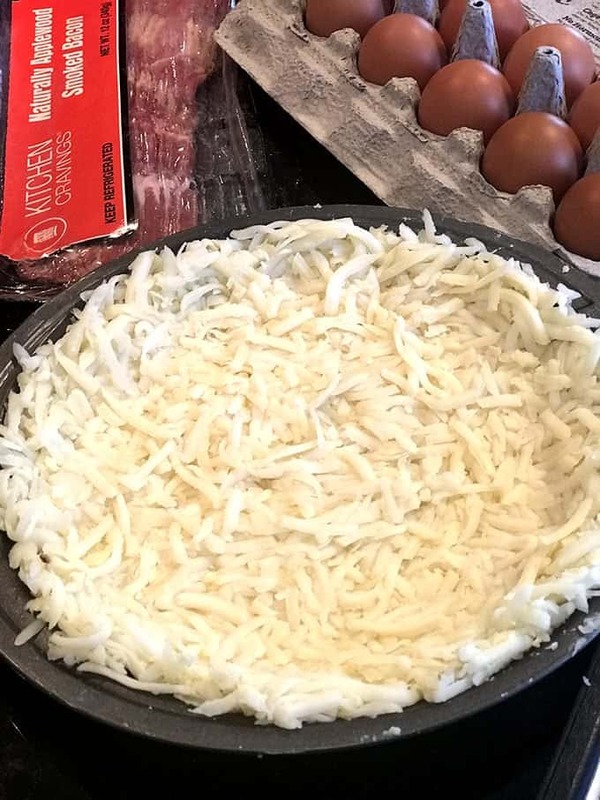 The filling for this gluten-free quiche is poured and then the whole thing goes back in the oven, where the temperature is lowered 350° F.
We add bacon to this easy breakfast quiche recipe but you can use whatever you have on hand. I assembled all of my ingredients and called Dan into the kitchen. After telling him what I was thinking, he ran and got his phone and started taking pictures. (No fancy camera this weekend!) This is scary sometimes because you don’t know how the recipe will turn out. However, I had a good feeling about this easy breakfast quiche. The butter and hash brown crust holds makes this a gluten-free quiche and the whole thing stays together quite nicely! 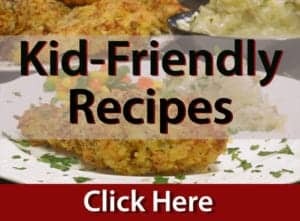 If you’re looking for more Easy Weekend Breakfast Ideas, here’s a short list of some of our favorite recipes! 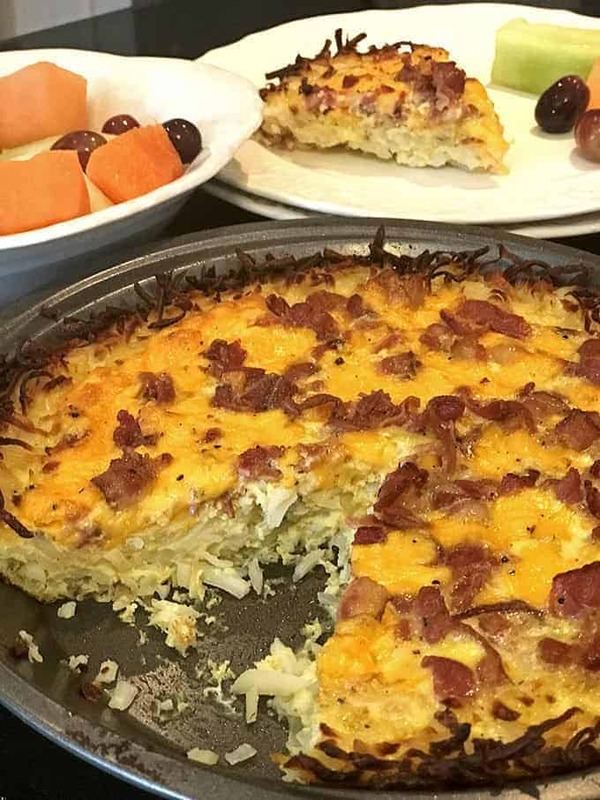 All of our kids love this hash brown quiche, even Joe who won’t normally eat eggs. 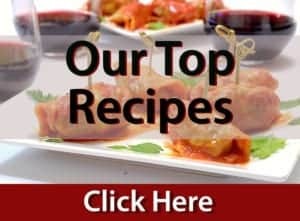 We have a couple of other quiche recipes you will enjoy. Our Crustless Vegetable Quiche Recipe is very popular with the gluten-free crowd and our Mini-Quiche Recipe is a fun appetizer that is perfect fort a weekend brunch. You're going to love this easy breakfast quiche from Platter Talk because it uses just a handful of ingredients and can be made for about $10. 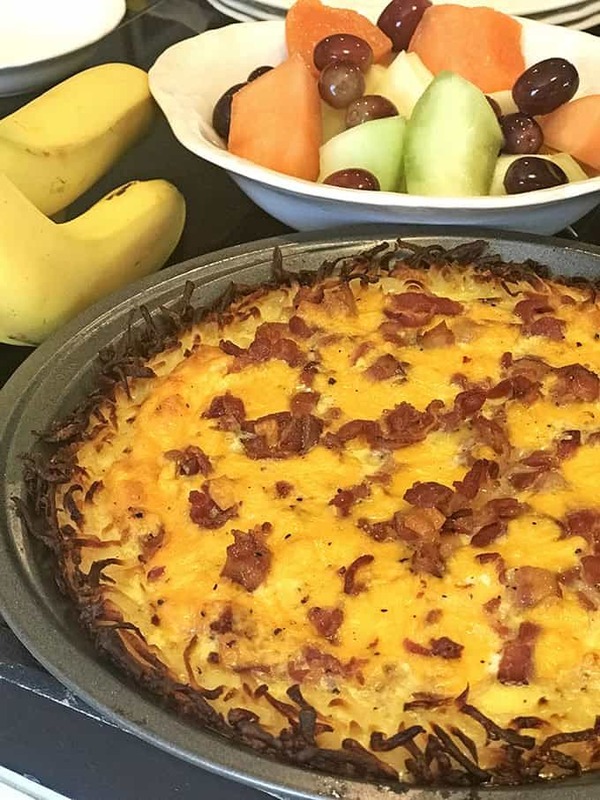 Make this hash brown quiche with bacon to feed your weekend crowd and have time to enjoy that second cup of coffee! Preheat oven to 450° F. Place the hash browns in a mixing bowl and using paper towel, blot out excess liquid. Pour melted butter over hash browns and then stir well to incorporate the butter. Press the mixture firmly into the bottom and sides of 9" pie plate to form the crust. Place in oven on center rack for 25 minutes or until crust begins to turn golden brown. Remove from oven and reduce oven temperature to 350° F.
In large mixing bowl, whisk the eggs and milk and then combine remaining ingredients and mix thoroughly. 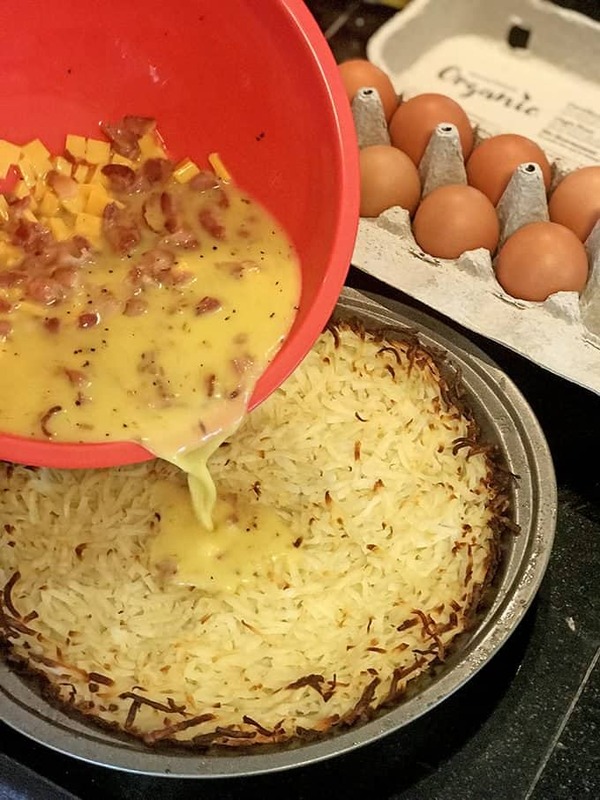 Pour the egg mixture into the hash brown crust and place into 350° oven. Bake for 30 minutes or until quiche is set and golden. Allow to rest for 5 minutes before cutting. 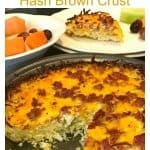 Pin this hash brown quiche recipe for later! Making this for the holiday weekend, I love how simple (and delicious-looking) this one is! Thanks for the feedback Martha; our family certainly enjoyed this one! Yum. Everything tastes better with bacon! Thanks, Chuck and yes indeed! Thanks, Mel! You will enjoy this one.